It's always a shame when a pub takes down their dartboard. Dave and I were planning to throw some darts at the Green Dragon last night during the New Old Lompoc meet-the-brewer, but the board was gone. 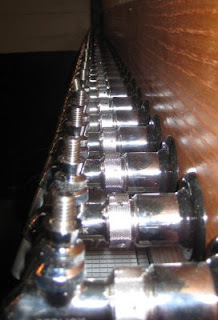 I was astonished by what took its place: a row of 30 gleaming beer taps! No, it won't be a self-service area. At some point a second bar will be installed there, and the new taps will serve up the house-made brews and others from around the Rogue Empire. Now that I look at my pictures from the Firkin Fest last weekend, I see the taps were there. I didn't notice them at the time; maybe they've been there for a while? It's a nice development, but I hope the Dragon will find a new place for the dartboard. They should move the little-used shuffleboard and put three or four dartboards up along that wall. The first cask to go on the new beer engine is Hopworks IPA. The growler refill price is complete madness: $17-$18 depending on the beer (six-pack equivalent: $19.12-20.25). No thank you. I didn't pay much attention to the bottles in the cooler, but I think they had a few Rogue offerings and some spendy Belgians. It looked like they had a to-go price and a drink-here price. The souvenir stand is interesting: you can get the hat and t-shirt not only for Rogue places, but for a few other Oregon breweries -- I seem to recall seeing Amnesia merchandise as well as Full Sail. That's team spirit! As far as I can tell, merchandise is the only discount that you can get at the Green Dragon by flashing your Rogue Nation identity papers. Just a quick note about the Lompoc tasting. The braggot they brought was interesting, but not something I'd reach for very often. There was an antiseptic smell and taste to it that might have been intentional or might not. For me the highlight of the evening was the 2007 Fresh Hop Red. I didn't expect a beer that old to keep much of the fresh-hop goodness, but it did and it was beautiful. It was a little maltier than the 2008 version they also brought. 2007 was the year of my most manic fresh-hop mission, but somehow I missed Lompoc's fresh-hop red that year. I asked the brewer Brian if it was the same beer as their Harvest Man, but he said no, that's a different brew, and the fresh hops in Harvest Man are actually ones that had already been used in another of the fresh-hop beers -- interesting concept. Mmm... fresh hop beer. Only six months to wait.